Some people say that the New Order opposes highsec mining. Some even petition us for "promoting bigotry" against the miners. Actually, we're strongly in favor of legal mining. What we're against is bot-aspirancy. And that takes on many forms, not just illegal mining in highsec. 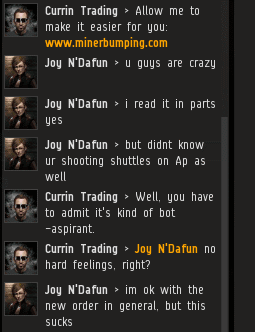 Joy N'Dafun convo'ed my alt, Currin Trading, after I popped her shuttle and podded her. I barely got a "hello" out before she volunteered a full confession of her crimes. Torture, for intel-gathering or law enforcement, is unnecessary in highsec. The carebears tell us everything--all we have to do is show up. Joy didn't deny having knowledge of the New Order and its Code. She did deny having read it. I've seen this song and dance before, so I humored her. 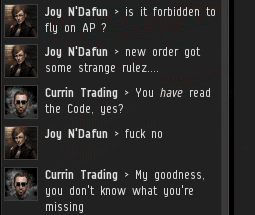 Joy admitted that she had, in fact, read the Code. By now, the Code is probably the most widely-read EVE-related document of all time. I suspect more EVE players have read the Code than have read the EULA. If players are expected to follow the EULA, why not expect them to follow the Code, which they're more likely to have read? Like a lot of people, Joy didn't have a problem with the rules--except for the one that outlawed her peccadillo of choice. As I often say, the Code is not a buffet. You don't pick and choose which rules you want to follow. You gotta take the whole thing. Joy left the convo. It was like one of those scenes in a movie where someone walks away from a negotiation, but then, after a high-tension moment, comes back. 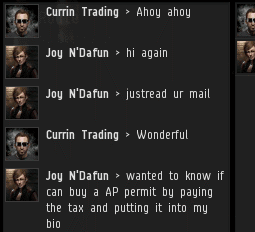 After reflecting on the Code and my "termination notice" EVEmail, Joy felt a growing desire to buying a permit. 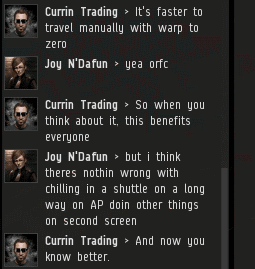 This is highsec in a nutshell. First the shock and outrage, then the absorption of the Code, then the turning over of a new leaf. This is why the New Order never gives up. We want to stick around for the good part. 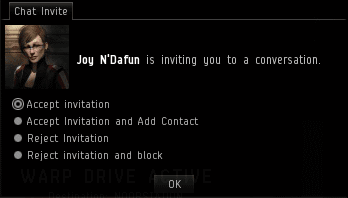 Joy and I parted on good terms. She understood her obligations, and I was willing to forgive her for her past failure to live up to said obligations. It was a give-and-take, a far cry from the "tyranny" that our critics accuse us of. 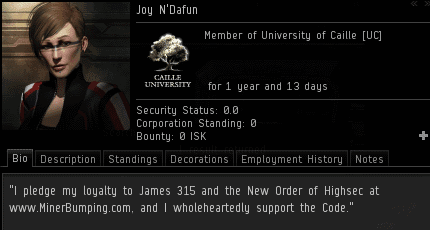 Joy purchased a permit and made a public declaration of loyalty to the proper authorities in highsec. If I hadn't been around to kill her, this wonderful transformation might never have taken place. The story had a happy ending. Of course, EVE is not a fairy tale or even a movie. It's real life. As such, it's a much more complicated. Not everything gets wrapped up so neatly. Despite the progress that had been made, Joy's compliance quotient had suffered a relapse. She'd exhibited symptoms of her old bot-aspirancy in my presence, and I had to kill her again. I'm willing to concede that autopiloting is a game mechanic that does not violate the EULA. However, autopiloting in an untanked vessel is an act that carries the presumption that highsec is totally safe. Classic bot-aspirancy--and totally against the Code. I was disappointed by Joy's betrayal, but wasn't too surprised by it. In our original conversation, I noticed she seemed to be preoccupied with her own needs--what she could get out of the deal. Although everyone benefits from the Code, it's not there to promote selfishness. The Code is about giving and sharing to promote the interests of the community as a whole. Ask not what highsec can do for you, but what you can do for highsec. It's a motto our Agents live by and fight for every single day. Another great write-up! I knew the second kill was gonna happen as soon as the 10 mil was paid and she thinking she had just purchased a "Free Pass" to continue her "might-as-well- be-AFK-mining" lifestyle. I'm still new to the game in general, so killing somebody in hisec or anywhere else is difficult, but I am trying!! Support James 315 and the New Order!! That will tell you what to train in what order for the most bang for your buck. Give it a go, team up, two pieces of advice. 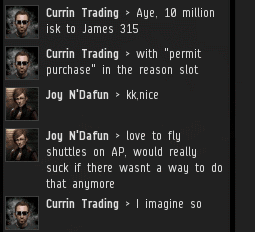 2nd - Never ever play Eve by plexing your account, until you can EASILY make enough ISK. 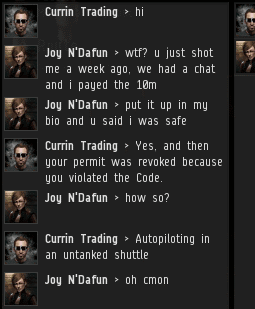 In fact, don't plex your own accounts even if you can, it has turned me off just logging in to Eve for the chase of ISK. So enjoy your daily sessions and good fortune, may the loot fairy always smile at you. Thanks for the encouragement Daniel. 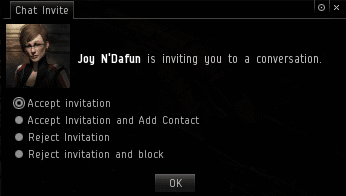 I quit playing about 4 months ago (after a 5 month beginning) because I got bored with the game I was playing and couldn't make decent ISK shooting NPC rats. 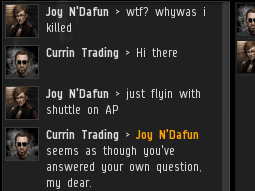 I lived mostly in lowsec and frequently got killed against other players as I was still a newb and I was not part of a corp and did everything solo. I have trained up all of the recommended ganking skills as per James's gank training guide. I have limited time as I am self employed IRL but I cant stand reading these blogs that James writes and not try to help and do my part. It just seems to be too much fun! The funny thing is, is the code is actually written and intended for the betterment of the game, as well as being fun to "encourage" players to agree to. It took me a little game experience to understand that. Just read the link - So much to learn! Awesome. I don't know the mechanics of infiltrating a corp, but any help would be appreciated. Hi Sole, infiltrating a Corp is easier than it sounds and it can be done with decent success with little skills. All you need to do is open the Corp recruitment tab and have a look around for a desired Corp; probably one that specializes in mining, or mission running as generally those Corps have the largest amount of players who are AFK/Bot-aspirant. If you think it's necessary you can also check the Corps KB to help determine what kind of PvP level the Corp has, if you're feeling a little uncertain on a specific Corp. When you find a Corp you feel comfortable infiltrating apply to join. You may have to be a little deceiving and say how you're interested in what they do, but sometimes carebear Corps will invite you to join with a blank application. When you accept and invite into a Corp, if you have any other invitations to other Corps, they will become null and you will have to apply again to those Corps. Now that you're in a Corp you have a few options, but sounds like you want to awox as soon as possible. Open up your star map (F10), go to "my settings" (if I remember correctly) and click the box that says "shows members in space" (or something to that effect). You will be able to see your Corpmates who are in space; this is delayed by 5 minutes and only shows members undocked, in space. The other way to find your Corpmates is to ask if there's a fleet up. If there is join it and head to the system they're in. Most of the time a mining fleet isn't going to have any protection. If it does, act accordingly. Remember they think you are their friend, ask what people have fitted and use that to your advantage if need be. If you join a mission running Corp, ask to join someone on their level 4 mission, and tank against what type of damage they're doing for the mission. Or, you can catch your mission runnering Corpmates on gates. Once you find your new Corpmates warp in and have fun! You may even be able to make some ISK while you do it through ransoming an Orca, or Exhumer, or expensive mission boat. The mechanics to ganking Corp members is simple. Concord will not interfere, you will not turn suspect. 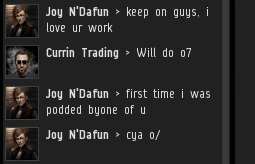 If you have a logi friend in a different Corp, he can come along and rep you without turning suspect. However, your Corpmates can shoot back at you. Be prepared that your Corpmates are on their way if your ransom is taking too long, or it's taking too long to kill all the ships you have pinned down through warp-disruptors/scrams. Odds are this won't be a problem if you all you want to do is pew pew your Corpmates ships. Also, your CEO/directors can't kick you while you're in space. 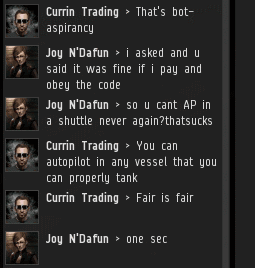 You can be kicked from Corp when you are docked, or offline. Eventually your character will become tarnished and it will become more and more difficult to join new Corps. If this is your main character, I would think about if this is something you really want to do as if you become bored with awoxing, most Corps that you would want to legitimately join won't take you. Wrote this up kind of fast, if you have any other questions contact me in-game, or here. I would add to Starfox's excellent instructions to take advantage of the mobile depot. Carry it, some ammo, and a prototype cloak with you. Drop it off in some system other than the one you plan on doing most of the murder in. If you want to take a break, go get some coffee, resupply, etc, just visit your in-space depot. Refit to a cloak then go to another system (where your depot isn't) and cloak up. Do not dock up unless necessary, when you are logged out or docked up is the only time they can kick you. Don't hate. The thing went to the wrong thing and I had to delete it to move it to the other thing. More horseshit from James. Children of the New Order regularly gank any miner regardless of whether they are AFK. They are so deprived they simply gank anyone not on their own personal list. Miners are idiots if they believe there is some master list of names of people who have paid. Fortunately you dumbasses can only muster enough dweebs to cover one tenth of one percent of highsec. I'm a miner, and I've seen the master list. You're wrong. "Fortunately you dumbasses can only muster enough dweebs to cover one tenth of one percent of highsec." The goal is not to cover highsec like a blob made of catalysts, but to police all of highsec effectively and fairly. Your alternate goal is weird and disgusting. If any miner is without a permit, afk or not, he is noncompliant and may be reprimanded. The horseshit you speak of is in the understanding you have of The Code. Also, for the record, most of us are neither deprived, nor depraved(which is the word i believe you were intending to use).